Looks beautiful but i cant imagine you dont have issues with the nut especially if there is overhang at the edges.. other than that id say roll with it.. Welcome to your new home page.. Interesting observation about the nut. What issues are you imagining? I haven't noticed but that could likely be because this is the only electric guitar that I have played (and the plastic nut broke very early in the guitar's life and I was a clueless high-schooler when I replaced it). I don't have another reference point and am not playing anything really technical yet. 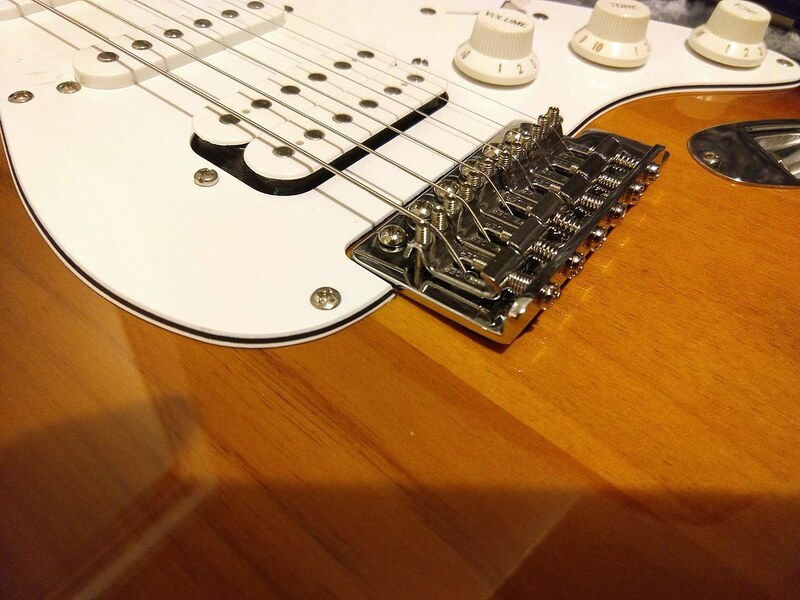 The nut primarily overhangs on the high/small e-string side. Well the first thing id be concerned about is individual string height.. check this by fretting the string at the third fret.. check the string clearance at the first fret.. the slightest of air gap should be noticeable (sorry i dont have a measurement right now but I'll search for one,, or a video) .. too much air and the string is most likely going sharp.. not enough air gap (string laying on first fret) and you will probably have a open rattle or buzz..
And lastly is comfort.. i have noticed anytime i have a guitar with a overhang or sharp edges it is noticable and bothersome.. i have enough trouble playing guitar without the nut getting in the way or distracting me.. these are just some of the things that come to mind when i saw this nut.. (I've never seen a aftermarket roller nut before,, only the fender version). If your not having any issues dont sweat it.. if you are having tuning or buzz and rattle issues id go back to the standard style of nut..
squierbilly- thanks for the detailed post of things to look out for! I think the roller nut is a Wilkinson type, a predecessor to the current LSR nut. Unfortunately, it did require wood removal to install. I checked string height at the 3rd fret and it looks good - pressing on the string in its mid-span with my finger on the 3rd fret and the string moves just slightly before it touches another fret. There is some occasional open string buzzing on the thicker strings but I'm not able to hear it through an amp. Seems like I dodged a bullet since I wasn't thinking about any of those things when I installed it years ago! I think my reasoning at the time was that I wanted a metal nut since the plastic one broke so easily, not knowing of all the other options that were available (the internet wasn't quite where it is today back in Y2K). squierbilly, SquierTap and Kenneth Mountain like this. BTW, I noticed the switch on my guitar is starting to get a little finicky. 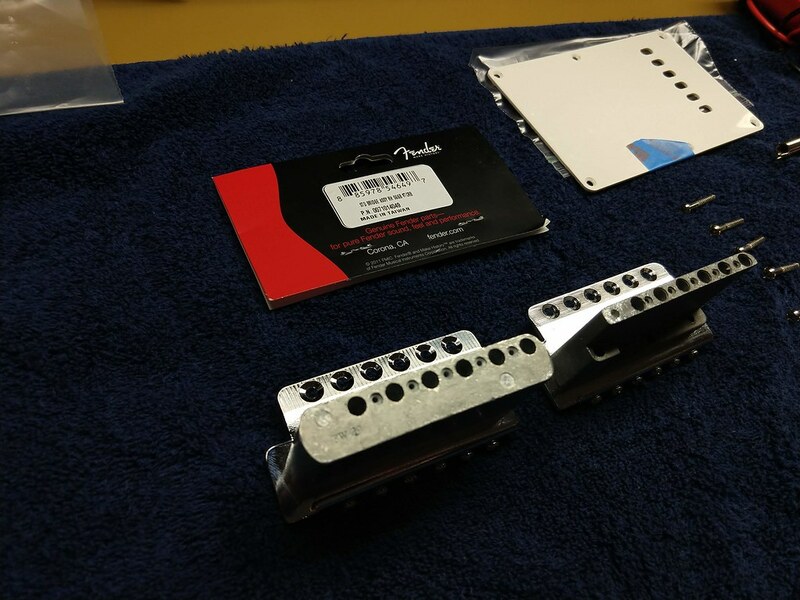 Is this Fender switch a worthwhile replacement or are there better aftermarket options? Should I replace the pots as well (and would 250K or 500K units be appropriate)? 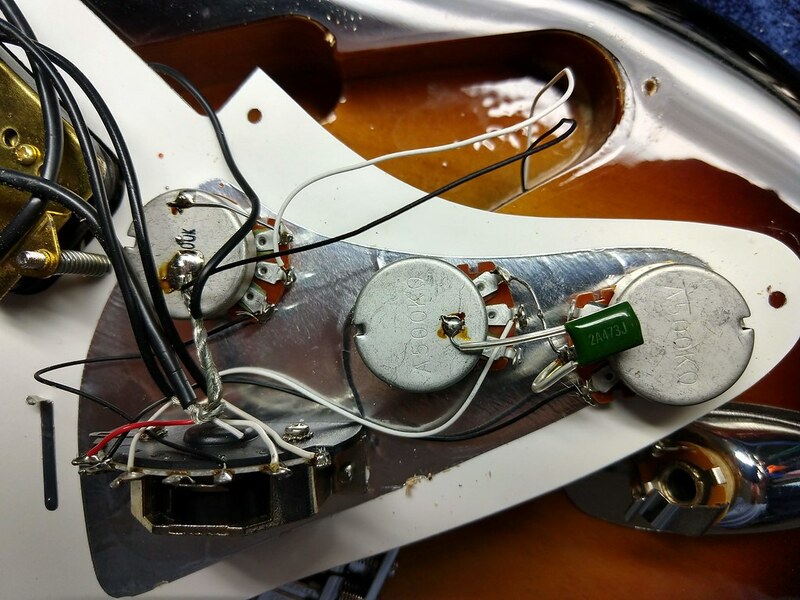 I read somewhere that Squier pots are typically linear whereas Fender pots are logarithmic...any truth to this? Thanks in advance! Overall it's been a blast getting to know this guitar better and learning how to properly adjust it. Having taken the pick guard off, I am now interested in building up a loaded pick guard of my own for the experience - just have to figure out what pups to load it with (seems like there are a mind boggling number of options out there!). squierbilly, Kenneth Mountain and SquierTap like this. kniah and Kenneth Mountain like this. My CY2000 has the same fittings, 500k log for tones and a 500k linear for the vol. I only replaced the vol with a 500k log. The humbucker is quite a nice pick up. Your single coils appear to be the same as what was fitted in mine, ceramic based at around 5k winding resistance and the higher flux density of Ceramic yields more output than the Alnico counterparts (which I tried) but the lower output of the Alnico resulted in a mismatch regards output levels. 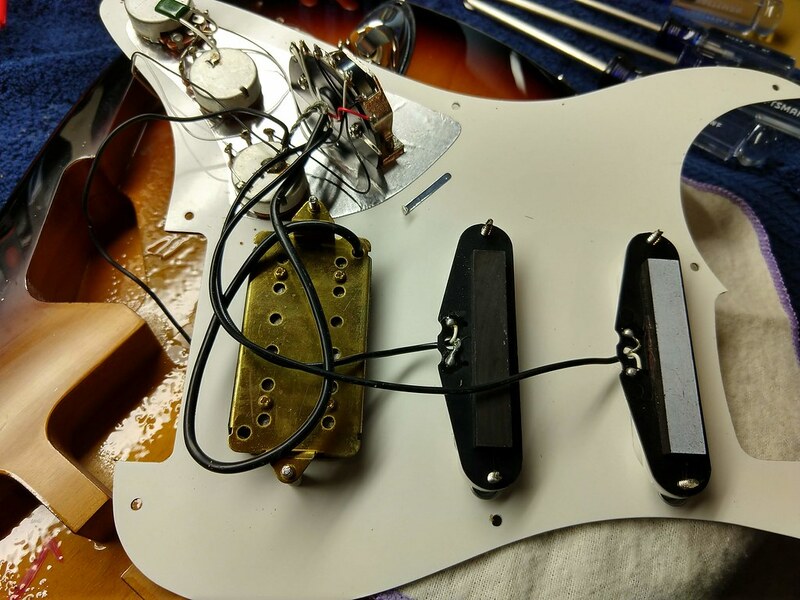 I am not a fan of single coil pickups particularly in combination with a humbucker so, for me anyway, the obvious upgrade is a Humbucker working with a pair of hot rails - that combination gives me the variety of tones that I need for my live performances. Try it with the stock pickups and judg for yourself if they deliver the tones you want. The switch may be serviceable and identical to mine as I noticed the assembly has two threaded screws that suggest it can be disassembled but you can get Heavy Duty 5 way switches on EBAY that are well made, I fit those as they are very reasonable regards price. SquierTap and kniah like this. Thanks! Yes, I definitely got lucky winding up with this gem as a clueless teenager shopping for a first guitar. After spending some time on this forum learning more about Squiers and having gone through the setup of this guitar myself, I am definitely appreciating the quality of this Strat. I've been playing a variety of stuff with the band so far - anything from freestyle blues jams (still in the infancy of my soloing career ha! ), to classics such as "I love rock n roll", punk rock (Offspring), 90's stuff (Spoonman, Lit), and Stevie Wonder (Superstition, and Sir Duke is our stretch goal). The set list is constantly evolving and we're working towards our first gig sometime this summer. For amps, I'm borrowing a 50W Marshall during practices and using an Ibanez Toneblaster 25R with a Digitech RP200 at home. Thanks for the heads up on the Boss Katana 100! I would have said I'd prefer a simple amp paired with an effects pedal but it looks like most combo amps come with built in effects these days. Will definitely keep the Boss in mind when I'm ready for an upgrade! Thanks for the info on the electronics! The contact cleaner seemed to do the trick on the switch for now. I like the stock HB (I probably use it 90% of the time right now) and am happy overall with the sound. 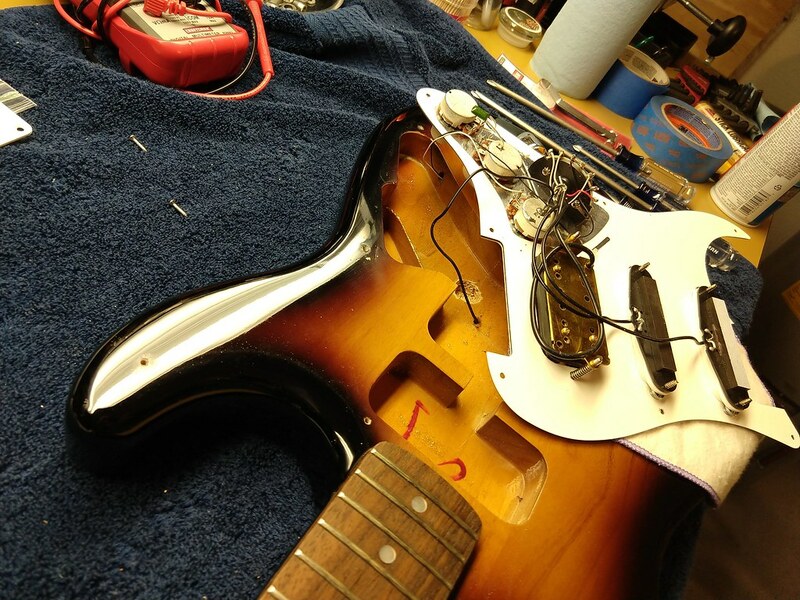 Having said that, I do enjoy tinkering (I've built my own bicycles, desktop computers, do most of the wrenching on my cars) so I will likely build up a custom pick guard on the side taking my time to research and understand the electronics to make sure they are well matched for whatever pickups I end up going with. More for the learning experience and having something interesting to try out when I'm finished. You say you changed the tremolo block but it looks like you swapped the whole bridge unit out.